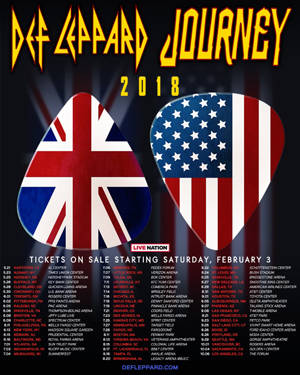 It's been rumored for months and now it has been officially confirmed: DEF LEPPARD and JOURNEY will co-headline a summer tour for the first time since 2006 when DEF LEPPARD was out supporting the Yeah! album. The 58-city trek kicks off on May 21 in Hartford, CT and concludes October 6 at the Forum in Los Angeles. The bands will equally split headlining spots and the itinerary includes 10 massive stadium shows, as well as visits to famous venues such as Madison Square Garden and Fenway Park. Tickets for most shows go on sale Saturday, Feb. 3 through Live Nation. A complete list of dates and cities is below.